Though often overlooked in surveys of cinematic greatness (indeed, actors in the first years of filmmaking were often expected to provide their own wardrobe), costume is essential for creating both character and believability in motion pictures, as attested here by actors like Meryl Streep and Robert De Niro. 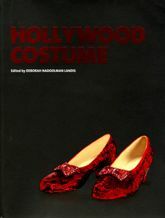 Academy Award�nominated costumer and design professor Deborah Nadoolman Landis takes a close look at some of Hollywood's finest and most eclectic costumes�seen here in 450 color photos and sketches�from such films as Ben-Hur, Cleopatra, The Wizard of Oz, Gone with the Wind, Pirates of the Caribbean, Ocean's Eleven, Sherlock Holmes, and Avatar. Many of these costumes have only been preserved due to the efforts of collectors like Debbie Reynolds, who contributes the preface.